What do you do to brighten up a grey, cold, wet and generally miserable Sunday? 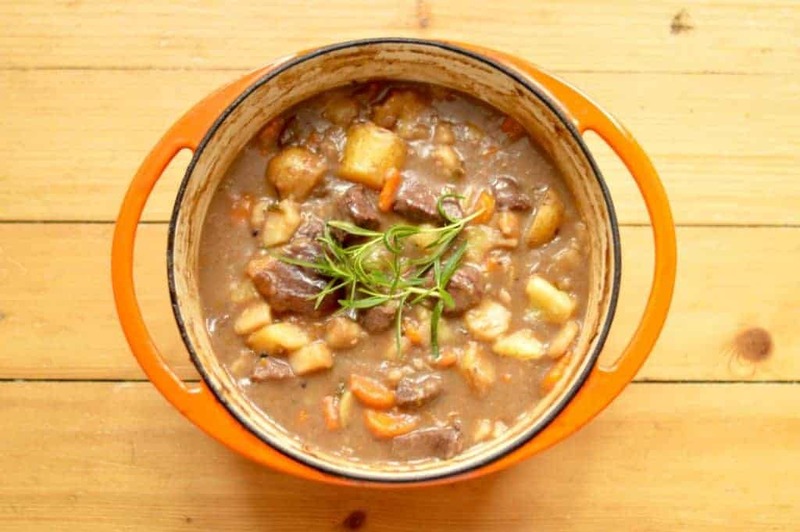 There are the trendy hygge options or maybe a cup of tea and a Disney film, but on this particular occasion, I opted for a culinary solution – a venison stew. I know, as you do. At this time of year, it can all seem a little like the weather is against us. But with a stew in the oven, the aromas wafting through the house let you know that dinner is going to be well worth staying in for – and perhaps an evening huddled up on the sofa isn’t so bad. There are so many things to love about the autumn months, from a produce and flavour perspective. For me, one of these great pleasures is Game. Sure, it’s not everyone’s cup of tea, but I really love the deep, earthy, meaty flavours get from venison, pheasant, and the like. What I like even more, is that shopping locally means it isn’t all that hard (or expensive) to get my hands on it at this time of year. Sure, the diced venison I bought for this stew was a little more expensive than buying beef or chicken, but it was considerably more than worth it. The trick to a good venison stew is, in my experience, all about the long, slow cooking. Herbs and extra flavours – like the red wine, recurrent jelly and parsnips I used here – are definitely part of it, but it is the long, slow cooking time that lets the venison cook in a way that will make it pretty much fall apart in your mouth. It does mean that stews like this are usually reserved for a lazy day when you’re at home for several hours – three hours in this case – but let’s be honest, even people like me who struggle to sit still for ten minutes fancy a lazy Sunday every so often. A stew like this also means I got to use one of my favourite bits of kitchenware – my bright orange, cast iron casserole dish. It comes in to its own in a recipe like this, as it retains its heat and everything inside cooks at a good, even rate. I would love to say that I have a whole range of Le Creuset kitchenware, but sadly that is not the case (Le Creuset people, if you’re reading this…). I am also not allowed to go in to their shop unaccompanied, or at the very least, without someone taking my credit card off me. What I do have though is my trusty sidekick, lovingly known as Le Fake-et. Sure, it was still about £35 and you can get similar versions online for about the same, but it does the job brilliantly, and is well worth having in the cupboard for lazy Sunday cooking. So what do you think, a lazy Sunday and a stew on the horizon? I hope so. 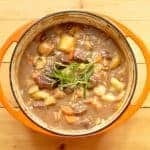 For me, the art of a good stew is in taking it slowly – this one sat in my oven for about 3 hours, and it probably could be done even slower than that. Cooking it slowly (and having plenty of red wine involved), will help give mouth-watering flavour and tenderness, even to cheaper cuts. Put the oven on to heat up to 150ºC. Start by putting a large, cast iron casserole dish on the hob on a high heat, this is so you can brown the meat. In to it place half of your butter and let it melt as the pan heats up. I put the cubes of meat in bowl, add a spoonful of flour, some salt and pepper. Coat the pieces of meat and let it sit for a minute. Once the butter is starts to melt, turn the heat down to a medium heat (the name of the game is low and slow!) and add in your venison. I normally do this in two or three batches so as not to crowd the meat in. Use a pair of tongs to turn the cubes of venison, browning equally on all sides. As the meat is browned, place on a plate to one side. Dice your onion and crush the garlic. Add the remaining butter to the pan and once it starts to heat up, add in the garlic. Stir slightly to coat in the butter and then let them gently simmer for a few seconds before adding in your garlic. Let them cook down until the onion is soft and translucent. If the onions start to brown, add in a bit more butter or a splash of water. Whilst the onions are cooking slice your parsnips and carrots, and quarter your potatoes. When the onion is soft, add in your wine. The aim here is to burn off much of the bitter alcohol and leave you with the beautiful flavours. As the wine starts to bubble, strip the leaves off your rosemary and add them in to the pot. Once the wine is reduced to about half its original volume, add in the carrots, parsnips and potatoes. Stir around to coat them in wine-onion-garlic goodness, then add the venison back in. Add in your stock, red current jelly and season a little. Pop the lid on to your casserole dish and in to the oven it goes. 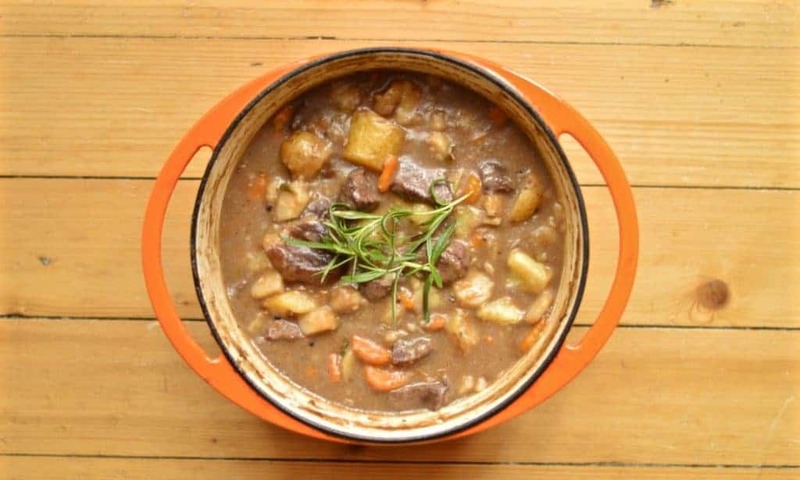 Check your venison stew after about 90 minutes to ensure there is still plenty liquid and there are no rouge bits sticking to the bottom of the dish. After three hours, take the dish out of the oven and mix it through. Taste and season as required. If the stew is not thick enough for your liking, you have two options: 1. put it back on the hob and reduce it down, stirring to avoid things sticking to the bottom; 2. get a couple of teaspoons of cornflour, mix into a paste with a little hot water, bring your stew to the boil and stir into the pot, continuing to stir for a minute or two so the flour taste is mixed in. Add a few sprigs more of rosemary and serve your venison stew with another glass (or two) of red wine.